Bitzy nail polish remover pads – Put Your Make-Up On! Hey guys! 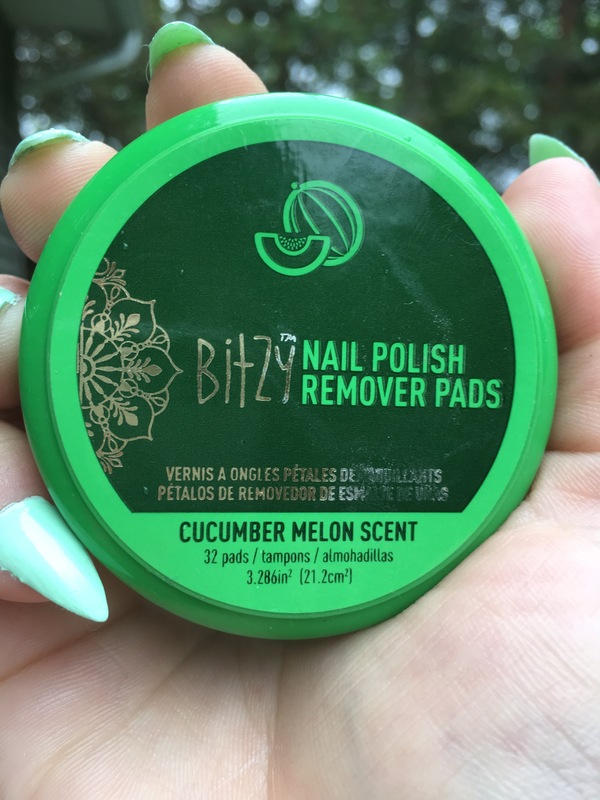 For my work, a part of my dress code is having my nails done and so lately, to remove my nail polish I’ve been using the Bitzy nail polish remover pads from Sally Beauty. So today I’m going to talk a bit about them. First of all, I have a really bad habit of biting my nails and getting them done professionally is not in my foreseeable budget. So I instead buy glue ons and paint them that way. The only type of glue ons I’ve ever known are plastic. This is what I have always used my polish remover pads on so that’s what my review is based off of. The performance may be different on real nails good or bad. These pads are extremely cost appropriate and would be great for people on a budget. They are scented and have four different scents. I picked up the cucumber melon scent and because it’s a nail polish remover and contains alcohol, you can smell the alcohol perfectly clear but you can also smell the cucumber melon and it isn’t bad. One thing I thought was going to happen was that the actual pads were going to be coloured the same as the packaging. I was disappointed to see that the pads were just white. However, this doesn’t affect the functionality of the product. The pad itself is felt and the way I use it is I just fold it in half and press it on my nail for a few seconds and then move it in a consistent motion. In about 10 seconds the movement starts getting smoother and smoother. This is the polish breaking down and going to my raw glue on nail. It is a very fast process overall and gets faster once it starts removing the polish. For both hands, I used about 5 pads. The thing I find about the pads are that it will leave residue and make my nails feel really uneven and growdy. Now I’m unsure if this could be glue getting on top of my nail when I glued them on, the other polish, or the length of time I have the same nails on. Or it could just be the pads itself. I will never know! Not only does it leave parts of the pad on my nails, it gives my nails a wax-like coating making it near impossible to repaint my nails and make it look like a smooth finish. This is an easy fix with a nail file. With that being said, it will reduce the strength of your glue on nail. And so overall, I’m generally impressed with the production of these polish removing pads. If you’re on a budget definitely pick these up. They’re so small and compact to throw in your bag for on the go and you won’t need to worry about it leaking all over your bag. I’m loving how convenient, non-messy and fast this is to do! On real nails, you may get a more satisfactory result so please let me know if you’ve used this on real nails before and your thoughts on the product! I would definitely repurchase this again, My goal is to try all four scents out!